Turnips are popular, nutritious root vegetables. 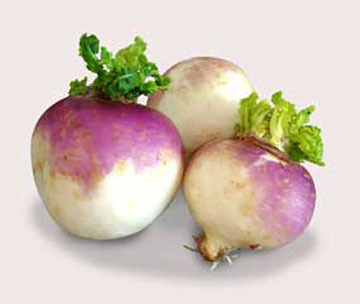 Turnips are very low-calorie root vegetables; carry just 28 calories per 100 gm. They are very good source of anti-oxidants, minerals, vitamins and dietary fiber. Here on this page, we will see some of the common health benefits of turnip. Turnips are popular, nutritious root vegetables. They are round, tuberous roots grown in different parts of Europe, and Asia as one of the cool-season vegetables. They belong to Brassicaceae family, a broad family of greens and vegetables which also includes cabbage, kale, brussels-sprouts, etc. These cruciferous vegetables contain high levels of antioxidants and phytochemicals, which reduce the risk of cancer. The inclusion of this vegetable in your daily diet can reduce the risk of breast cancer as well as colon and rectal tumours. Turnip greens are high in fibre which helps support the body’s digestive system. Some research suggests that glucosinolates may also help the stomach process bacteria like Helicobacter pylori. The high fibre content of turnips promotes an active, healthy metabolism as well. The vitamin A contained in turnip greens helps in maintaining healthy lungs. Turnips are a great source of calcium and potassium, essential minerals for healthy bone growth and helping to prevent bone diseases such as osteoporosis.